Today is the first day of Hanukkah, so take a moment to plan a few eco-friendly ideas for your eight festive nights. Hanukkah is all about celebrating our freedom and spending time together as a family. You can have a super-special, festive Hanukkah without spending a lot of money and or leaving much of an impact on our environment. One of my favorite things about Hanukkah is that it is a very traditional holiday that can be enjoyed in a very simple manner. 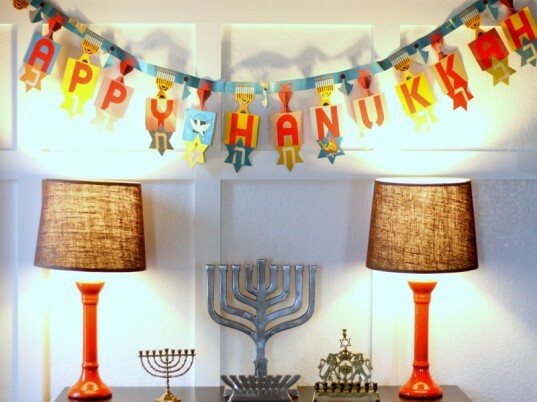 Read on to learn my 7 favorite ways to celebrate Hanukkah with your children that are simple, fun and eco-friendly. Making your own candles to light the Hanukkah Menorah each night of Hanukkah is easy when you are using sheets of organic beeswax. You can purchase sheets of beeswax from your local beekeeper. 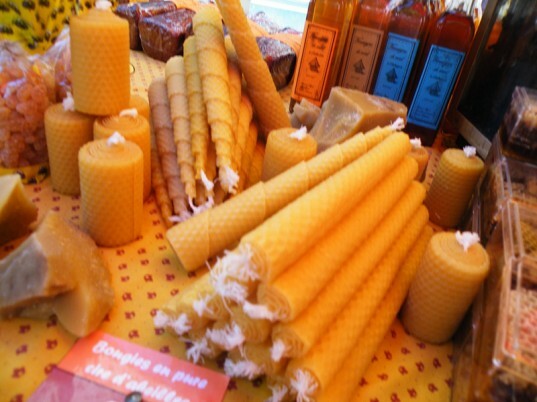 Simply lay a string of lead-free wick that is the same length of the beeswax sheet and roll into a tight roll. This is an activity that children of all ages will enjoy. Having fun activities planned to celebrate each of the eight nights of Hanukkah is a nice idea for little ones. For example, write a special activity on a piece of paper, place it inside an envelope and let your children open one envelope for each night. These activities should be traditional activities that focus on family such as having a family Hanukkah dinner, volunteering together as a family, baking donuts or latkes or dancing and singing together. 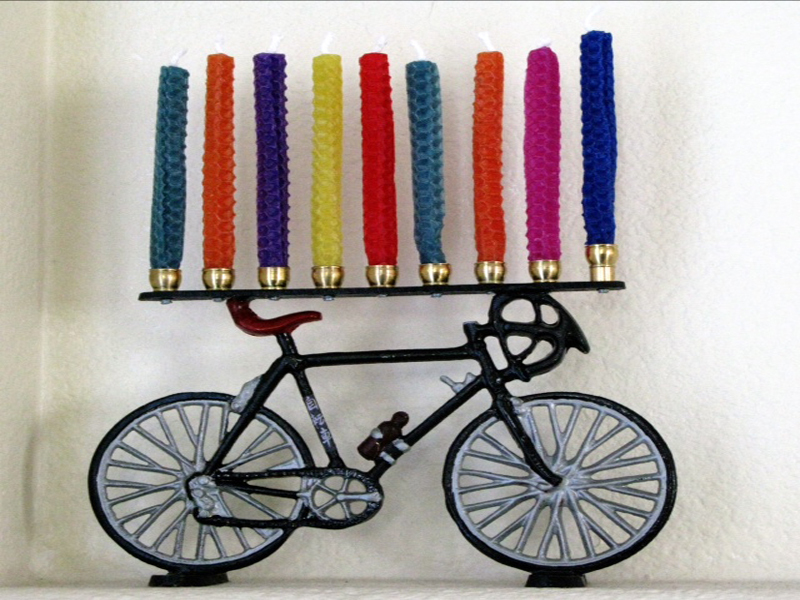 Making a Menorah is a fun, easy craft that you can create with many different household items. You could place 9 blue mason jars in a window, lighting a candle and placing it inside each jar until all of the menorah candles are lite. 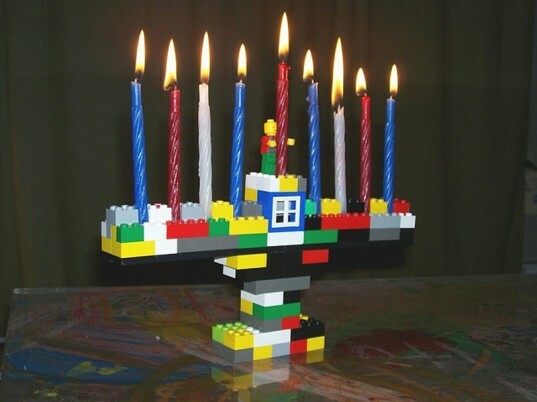 Other ideas include; small vases or glasses filled with rocks with a candle standing in each or you could even construct a menorah with your children using LEGO bricks. 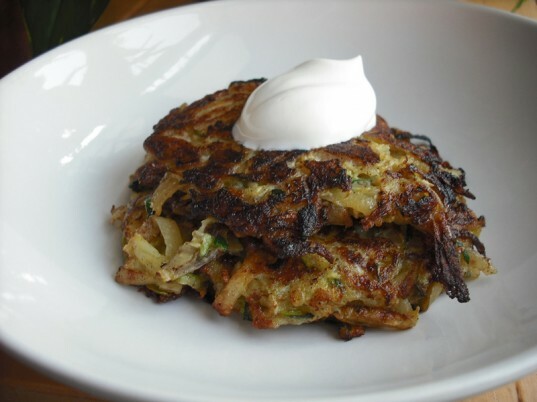 One of the best parts of Hanukkah are the latkes and jelly donuts. Spend the extra time that it takes to make these goodies from scratch with your children. It’s a tradition that they will look forward to each year and as they grow older, and a memory that they will always have. Baking Hanukkah goodies together as a family is an activity that they will enjoy sharing with their own children one day. If there is one game that is synonymous with Hanukkah, that is drediel. 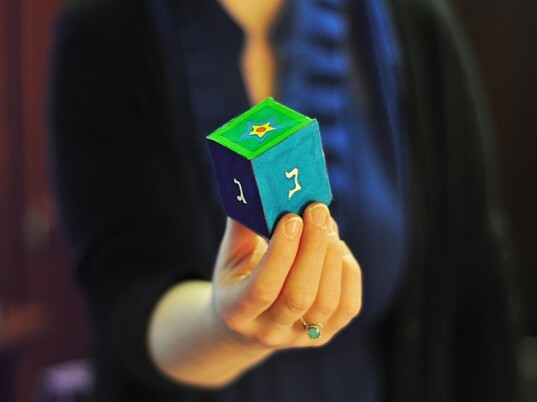 Dreidel is a easy game that children of all ages will enjoy. All you need is a dreidel (a toy top) and gelt (little treats). Add a little extra fun to the game, by spending time with your children creating your own Hanukkah dreidels. You can make them from all kinds of different recycled items including egg carton, paper and cardboard. One way that I like to celebrate each of the nights of Hanukkah with my son, is by reading a Hanukkah story or singing Hanukkah songs. We have several Hanukkah books stacked on our coffee table and our family enjoys having a cup of cocoa and reading the stories aloud together. Then, we like to finish the evening by singing Hanukkah songs together. Instead of purchasing new gifts to give to your favorite charity during Hanukkah, give back by donating gently used toys that belonged to your children. You could also spend time with your children making gifts to give away during the eight nights. If you have a special talent such as sewing, you could sew gifts. Another gift that is priceless is the gift of your time – consider volunteering during the holiday season and giving back to your community. 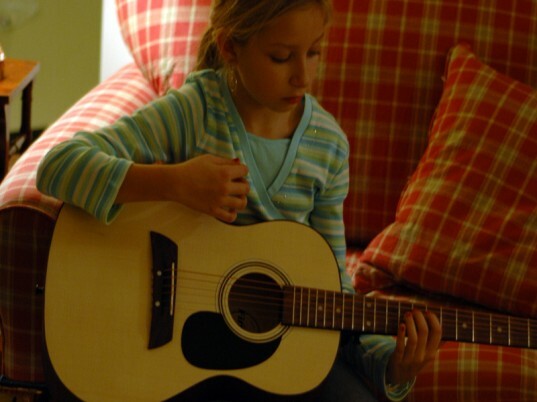 How do you celebrate Hanukkah with your children? One of the best parts of Hanukkah are the latkes and jelly donuts. Spend the extra time that it takes to make these goodies from scratch with your children. It is a tradition that they will look forward to each year and as they grow older, it is a memory that they will always have. Baking Hanukkah goodies together as a family is an activity that they will enjoy sharing with their own children one day. Instead of purchasing new gifts to give to your favorite charity during Hanukkah, give back by donating gently used toys that belonged to your children. You could also spend time with your children making gifts to giveaway during the eight nights. If you have a special talent such as sewing, you could sew gifts. Another gift that is priceless, is the gift of your time - consider volunteering during the holiday season and giving back to your community. Instead of purchasing new gifts to give to your favorite charity during Hanukkah, give back by donating gently used toys that belonged to your children. You could also spend time with your children making gifts to give away during the eight nights. 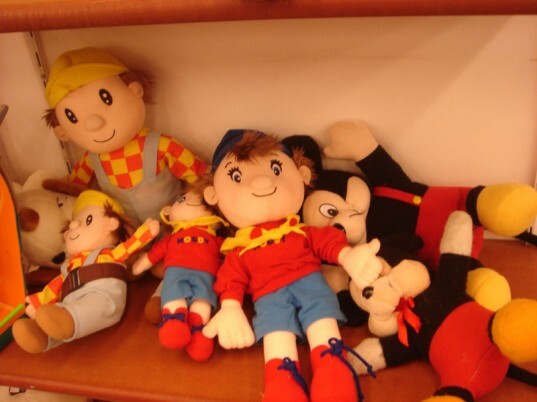 If you have a special talent such as sewing, you could sew gifts. Another gift that is priceless is the gift of your time - consider volunteering during the holiday season and giving back to your community.